What does a go brit! fish + chips Franchise Cost? Authentic Fish+Chips with a bright, bold British brand -- a fresh approach for the hot fast-casual segment. go brit! is a perfect opportunity for those with experience in the restaurant Industry. 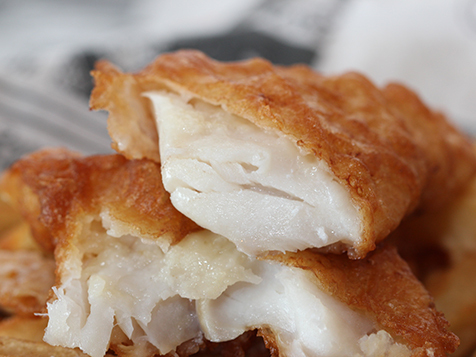 Authentically delicious tender white fish in beer batter, delivered with bright, bold British décor. The result is a new fast-casual concept that Americans just love. 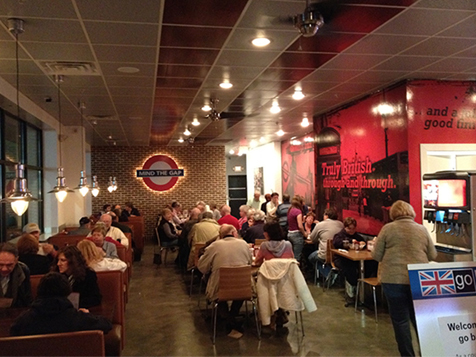 This eatery takes fish and chips to a whole new culinary level, just as others have re-invented the hamburger, go brit! opens up a whole new space in taste and brand attraction. From the red telephone booth front doors, to the Union Jack flags and iconic London buildings on the walls, go brit! taps into our love of all things British. Even Londoners say it’s spot on – from the light flaky, golden battered fish they’ve never found in the states, to the crispy and chunky fresh spuds cut daily in the Euro-style. Open go brit! fish + chips in any of these available states: DE, FL, GA, KY, MD, NJ, NC, OH, PA, SC, TN, TX, VA, WV, DC. Cash in your chips with this brilliant opportunity! Nobody knows that better than Alison Blyth, a restaurateur and Londoner known as the “Queen of Fish & Chips” by the media. She has packed in a franchise concept called go brit! 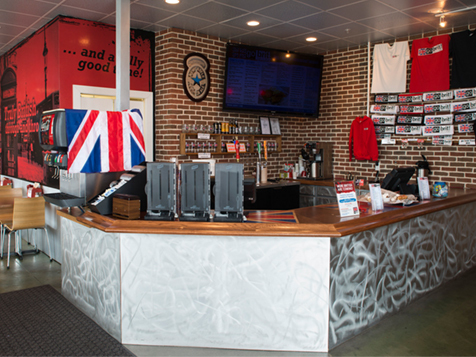 all the elements of a perfect fish-and-chips shop that speaks to America’s love for all things British. go brit! is one of the only chippies (fish-and-chip shops) that sell widely popular British comfort food in a fast-casual service format. The eatery takes fish and chips to a whole new culinary level, just as many “better burger” joints have done with the everyday hamburger, resulting in the creation of a whole new industry. Finally, a truly fresh franchise concept for the proven fast-casual market. Bring your passion and we provide the expert knowledge of fish and chips and authentic recipes, a bold brand and proven systems to create a fast-casual favorite. The go brit! 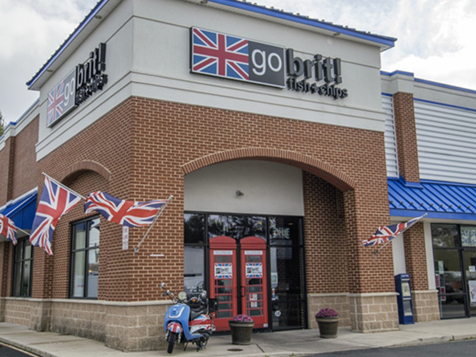 flagship store in Lewes, Delaware provides an established fast-casual model having been open since 2012.
go brit! is inspired by our own go fish! restaurant in Rehoboth Beach, Delaware, which has received widespread acclaim for more than 12 years. Fast-casual is the fastest growing segment of the restaurant industry led by brands like Chipotle and Panera Bread. 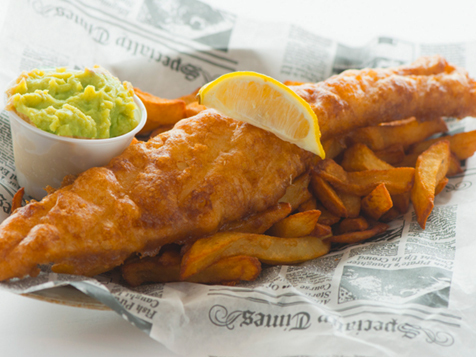 A streamlined menu with fish and chips as the centerpiece makes running a go brit! easy to operate. go brit! has an experienced and passionate management team to guide you every step of the way. You will receive both in-store and classroom training for all aspects of your go brit! business including food preparation, sales and marketing techniques, as well as administrative and office matters. We will also provide support prior to, during and after you open your own location. According to industry sources, consumers perceive that fish is healthier than other types of protein*. The U.S. seafood market is an approximately $17 billion industry, expected to reach over $20 billion by 2019.
go brit! is looking for franchisees with outgoing personalities, outstanding work-ethic, passion for customer service, and a love of fish and chips, who have a minimum net worth of $400k and $200K in liquid assets. Restaurant experience and a British connection strongly preferred. Won’t you join us in our quest to revolutionize this new hot segment in the fast-casual industry? Contact us today by adding us to your cart and completing the inquiry form.